I’m so glad it’s Friday! I’ve been really struggling to get back into a routine with school runs and everything. I have to admit I didn’t do any juicing over the holidays and with the weather being all over the place I feel like I’m coming down with something so it’s time to get my juice back on! 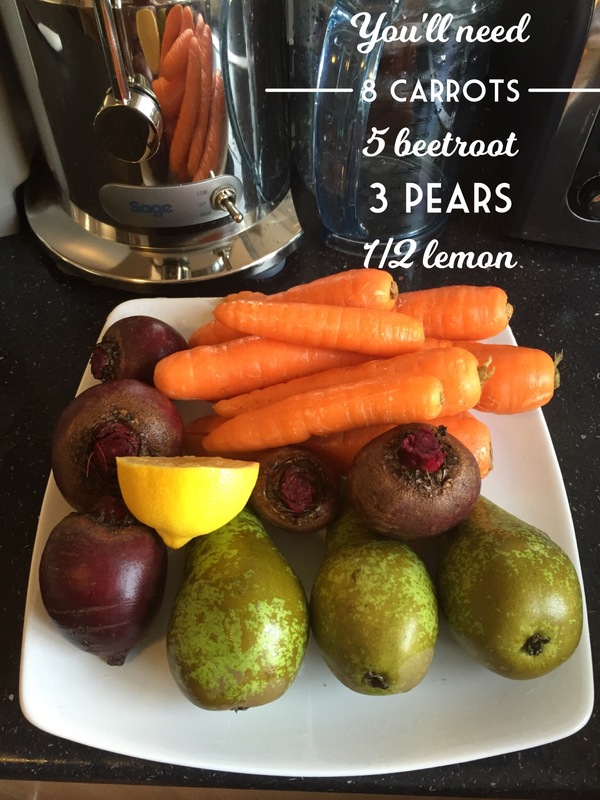 Today’s recipe is Carrot, pear and beet juice. I love the vibrant colour of beets and somehow I managed to stain my walls and ceiling using my old juicer. Beets are an excellent source of folate (Vitamin B9), manganese, potassium, copper, magnesium, phosphorus, vitamin C, vitamin B6, iron and also a good source of dietary fiber. Carrots are best known for their beta-carotene content. They are an excellent source of vitamin A (in the form of carotenoids). In addition, they are a very good source of biotin, vitamin K, dietary fiber, molybdenum, potassium, vitamin B6, vitamin C, manganese, niacin, vitamin B1, panthothenic acid, phosphorus, folate, copper, vitamin E, and vitamin B2. Lemons helps to strengthen the immune system and are a good source of vitamin C, vitamin B6, vitamin A, vitamin E, folate, niacin thiamin, riboflavin, pantothenic acid, copper, calcium, iron, magnesium, potassium, zinc, phosphorus and protein. I hope you enjoyed this simple recipe. Will you be juicing in 2016? Please feel free to comment below.